I always approach summertime with an even mixture of excitement and dread. I know how important summer time is to a kids emotional and physical development and I want our summers to be filled with happiness and joy rather than yelling and chaos. Here are some of the things I love and don’t love about summertime and how I rein in the things I don’t want to get out of control. I love having my kids home with me all day. I love that we are all together all of the time and our relationships grow. I love that our days are wide open and we can pack up and go anywhere we want whenever we want. I love working in my yard while the kids play together in the water. I love wearing flip flops. I don’t love when the kids fight. I don’t love toys scattered all over the house. I don’t love when kids get so tired they can’t function. I don’t love otter pop wrappers sprinkling my yard. I don’t love grasshoppers living in Mason Jars in my daughter’s bedroom. I don’t love water balloons sleeping in the bathtub. I tend to be much happier when I follow a strict structure and routine. I like to do the same things at the same times. I like to be predictable. Of course, fate would have it that I have a 6 year old son who is the same way. He thrives in situations like school and church because there is always something to do and the schedule is clearly defined. He struggles when my schedule says, “kids play freely”. 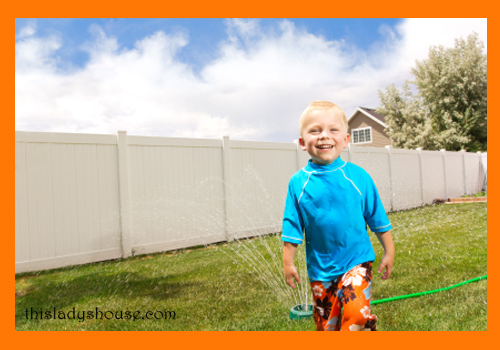 Because he suffers from “I’m just like my mom” syndrome, summertime can be a big challenge in his life. 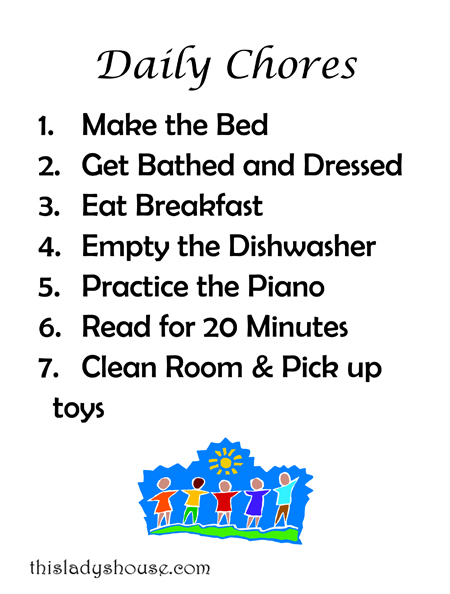 In an effort to make things a little easier the kids helped me make a clearly defined list of things to be done each day. Along with the list of daily chores we made a list of summertime rules (guidelines that if not followed could ultimately destroy the fun and excitement of summertime), and a list of daily activities (a fun activity that we would do together that gave us something to look forward to). 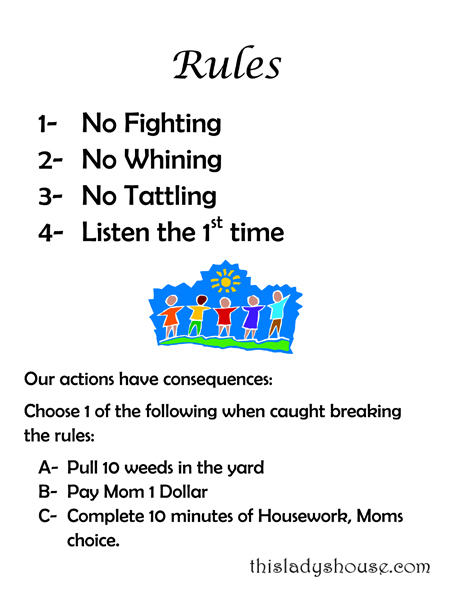 This list of summer rules and daily chores is not really any different from our rules and chores all year long but my kids tend to be motivated and encouraged by sitting down and discussing the reasons for rules and responsibilities. They LOVE having new lists made to hang on the pantry door, even if the lists say the same things as the old ones. 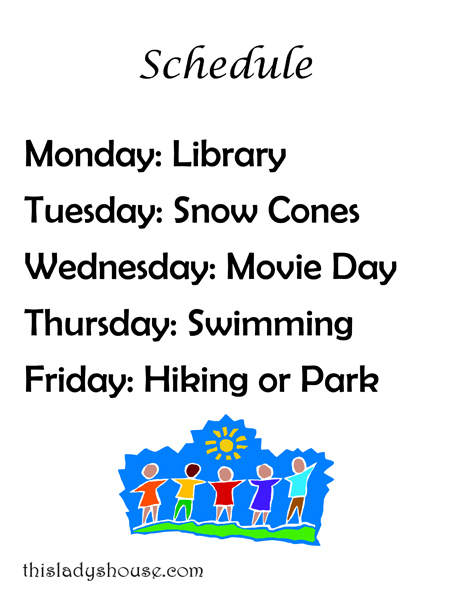 What types of things do you do to keep your kids motivate and busy during the summer? This entry was posted in Projects and tagged Kids, Parenting.